When born: 13th September 1916 – this was in the middle of the First World War! Where born: In South Wales in the United Kingdom, but both his parents were Norwegian and he used to spend his holidays as a kid in Norway with his grandparents. Sadly, his dad died when he was just four years old. School days: Roald Dahl HATED school! He went to a number of private boarding schools in England, including Repton which is really famous. But he said that school was just “Days of horror filled with rules, rules, and still more rules”. Why and when he began writing: When he left school, Roald Dahl refused to go to university because he wanted adventure in ”wonderful faraway places like Africa or China.” So he went to Africa with Shell Oil Company, then in 1939 when World War Two broke out he joined the RAF as a fighter pilot in the Mediterranean. When his plane was shot down over Egypt he suffered severe head injuries, so he left the airforce and became an adviser to the government in Washington DC in the US. It was then that he was asked to write short stories for grown-ups in magazines – he said it was just a fluke that he started writing and he wouldn’t have ever done it if someone hadn’t asked him to! Roald Dahl wrote his first children’s story, The Gremlins, in 1943, but it wasn’t until he had his own children (five of them!) and started making up bedtime stories that his career as a children’s writer really began. His first ever full length kids’ book was James and the Giant Peach, published in 1961! Why I love Roald Dahl’s books: I love Roald Dahl’s writing for adults as well as kids, but the reason he’s my favourite kids’ writer is because he’s very funny, he never “dumbs down” his books but uses wonderful language, his plots have lots of twists and turns and always keep you on your toes, and the characters are just fantastic – disgustingly bad or extremely good, or very clever, or amazingly talented or just plain bizarre! It would be impossible to become bored reading one of Roald Dahl’s books! When Roald Dahl was at school, he and some other boys got into terrible trouble for putting a dead mouse into a store-keeper’s candy jar! No wonder he wrote such amazing books as Matilda when he later became a writer! Today we know that during the time that Roald Dahl was in Washington DC he was actually working as a spy for the British Government! 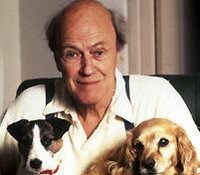 Even when he became really famous, Roald Dahl always wrote in a shed at the bottom of his garden, surrounded by greenery, sun and breezes, birds singing and of course his dogs! Now THAT’s the life for me! Useful website: There are dozens of websites about Roald Dahl, but in my opinion the best is his official website where you can read all about his life and his books, there is really funny animation and music, and even better, you can actually hear Roald Dahl talking about his writing! It’s one of my favourite author websites! Roal Dahl is one of my favourite authors to!! Glad to hear it Madeleine! That’s great Jessica – which book was it you read? He’s one of my favourite authors! That’s such a great book – are you enjoying it? I have read two books by Roald Dahl, they were hilarious. I am currently reading Boy. It is very interesting because I got to know the author much better. Believe it or not, we actually have some things in common! Caleb that’s really interesting! Tell me what you have in common with him – I’d love to hear! Here are some things Roald Dahl and I have in common. We both get homesick easily, we have a similiar sense of humor, and both of us take annual vacations with our families. Do you think Roald Dahl’s family influenced his writing? Or do you think his boarding schools did more? In my opinion, it was boarding school because the head master always made him write letters home for at least a half an hour a day. Hi Caleb – I think they were both very important. I agree about the boarding school headmaster, as letters are a great way to practise writing; on the other hand his father was always telling him Norwegian folk tales as a child and this must have been very formative for him as a writer. Either way he started writing young and kept going! Something I learned about Roald Dahl is that his father only has one arm! He was working on the roof of a house, when he slipped off and broke his arm. Since they didn’t have the technology that we have today, he had to have it amputated. Later on in the book he says it didn’t affect him much, but there was still one thing that troubled him. He found it impossible to cut a boiled egg with his sharpened fork. That’s an amazing story Caleb – thanks for letting us all know! I read some books by Roald Dahl and the their awesome! I agree Isabella! Which one is your favourite? If I could recommend one book it would problably be The Twits. It made me laugh so hard when I read it, that my chest started to hurt. The way Roald Dahl described everything and everyone is what really made me laugh. Charlie and the Chocolate factory was also a good book. I think The Twits was better though because I personally saw much more humor in it. Thanks Caleb so much for your comments. My favourite is Matilda. What does everyone else think? My favourite is also Matilda!!! I just read that when Roald Dahl was very little he got his nose cut off in a car crash. His sister was driving fast but then she had to step on the breaks. As soon as she did that almost everyone in the car got flung out the top. Everyone but young Roald Dahl. He went through the windsheild and a piece of glass cut him. All of these facts that I am learning about him really makes me want to read much more of his books. Wow that’s really interesting Caleb – let me know if you find out any more fascinating facts about him! I love reading his books!!!!!! He found it impossible to cut a boiled egg with his sharpened fork. That’s fascinating Jay – thanks for writing! I think Roald Dahl is a very creative person because he always makes up new words! i know. i am currently reading the BFG and it is really funny! That’s great Ruby – Roald Dahl is a fantastic writer for kids, and I love all of his books! Me too, Kodie. Though Matilda is probably my favourite! I love Rauld Dahl’s work. So do I! Especially “Matilda” and his book “Revolting Rhymes”! Which is your favourite Roald Dahl book? Roald Dahl is an amazing author. I love “Matilda” and “The BFG”. Also, “Boy” tells the story of a charming adult whose childhood was happy but sad at the same time.